Hekab Be staff and library users had a wonderful last week of October that included both Halloween and Day of the Dead festivities! On Thursday, October 29th, the library hosted a Halloween party complete with costumes, trick or treating, and a haunted house. The kids all arrived around 3 p.m. and starting putting on their costumes, painting their faces and getting in a spooky frame of mind. Then they played a number of games including: toss the eyeball, hang the skeleton, and pin the nose on the pumpkin (for the smaller kids). As dusk fell, the kids ventured out in 3 groups to trick or treat at local businesses who agreed to help pass out treats: Mulgrew Laundry, Minisuper El Pueblito, Las Casitas Akumal and Hotel Akumal Caribe Receptions, and La Cueva del Pescador. Upon returning the library the kids had their first chance ever to enter a haunted house or “casa de terror” where they were thoroughly scared out of their wits by witches, a vampire emerging from a coffin, the grim reaper, a mad scientist and a mummy. On the way out they were treated to mummy fingers (gummy candies) and vampire blood (strawberry soda). They loved the experience so much that after going through once they all got back in line to do it over again! On Friday, the kids engaged in preparations for the arrival of the spirits of departed loved ones, locally known in Mayan as Hanal Pixan, meaning “food for the souls.” Generally people make small altars in their homes where they put out photos of their loved ones, and food for the spirits to partake in. The celebration takes place over a couple days, with the spirits of children arriving on the first night-- for them sweets and hot chocolate is put out on the altar. On the second night the spirits of the adults arrive, and people often make favorite dishes as well as catering to the departed's vices with items such as, coffee, liquor or cigarettes. The children made tissue paper flowers with help from visitors Barb Youzwak and Joan Weiskotten. They also painted and cut out items to decorate the altar including different foods such as hot chocolate, special tamales called pibes, sweet bread, fruit, water, and candles. 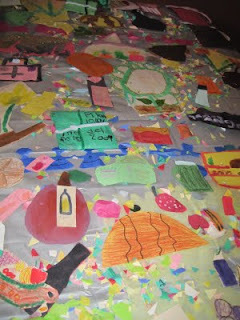 On Saturday morning, the altar was assembled, using all the items the children had made. The kids were treated to pan de muerto (a special sweet bread made for the holiday), chocolate milk and some Halloween candy. Leo talked with them about the meaning of Hanal Pixan, and the variations in how families celebrate it locally. (Note: The Contest for Day of the Dead Altars in Akumal which we'd planned to participate in was canceled, for unknown reasons). Special thanks to those who answered our plea with donations to help us put on these celebrations-- with that money we were able to provide many Halloween and Day of the Dead goodies for the kids!! Many thanks as well to the Youzwaks and Weiskottens who helped us put together our haunted house, and made it super spooooooky!!! Our long time assistant librarian, Reyna, has left Hekab Be to get married. Reyna was a favorite with the kids, and is known by some visitors who took Spanish classes with her. We wish her the best! We have 2 new staff members, Carlos, and Belen. Carlos speaks English and can help answer any queries you may have when visiting. His English is quite good, but he's a bit shy, but we're helping him work on that! 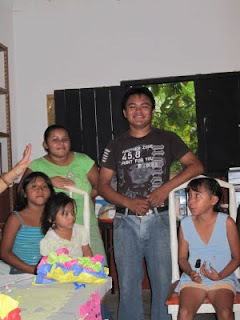 Belen works part time in the afternoons and on Saturdays, primarily assisting with the children.